This photograph is from a small collection owned by Ron Short, a Great War veteran I knew and interviewed in the 1980s. Ron was from Eastbourne and served in the ranks of the Royal Sussex Regiment until he was wounded in 1916. He was then commissioned in the Queen’s Royal West Surrey Regiment and served as a platoon commander at Arras, in Flanders and Italy; he was awarded an MC for bravery at Passchendaele in 1917. The photograph was taken during the advance to the Hindenburg Line in March 1917. The 2nd Battalion Queen’s Regiment, with whom he served, had advanced on positions just short of the village of Bullecourt. 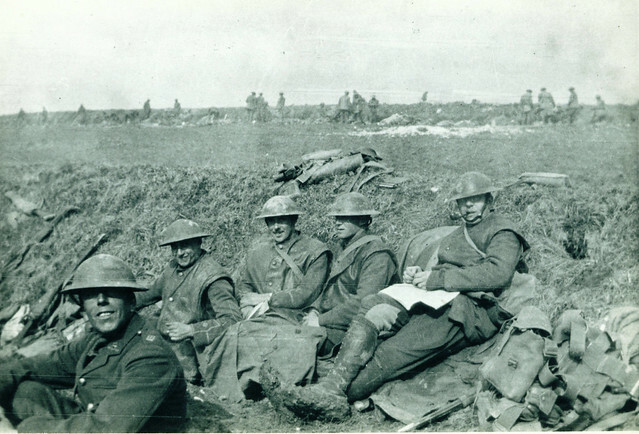 At this point there were no British trenches to occupy; in the background men from his company are digging in and in the foreground the officers are sheltering in a fold of ground. It was cold in March 1917 and they are all wearing leather jerkins. They have all attempted to blend in with the men in their style of dress. Ron himself is in the photo, second from the left, smiling. It was taken by his batman. All of those featured in the photograph fought in the Battle of Arras in April-May 1917, including the advance to the Hindenburg Line at Bullecourt itself. This entry was posted on 02/01/2012 by sommecourt. It was filed under Arras, Great War, Hindenburg Line, Western Front, WW1 . Great! Interesting mix of cuff-rank and shoulder title insignia. Was the webbing equipment to the right of the photo from one of the officers, too, I wonder? Hi Peter – yes, I have about another 30/40 from this collection. They do show the transition in the way officers dressed very well. More will be posted in due course. Excellent, can’t wait to see the others – who took them, given the restrictions on cameras at the time? They were taken by Ron short, the veteran I mentioned. Or at least he claimed to have taken them! He certainly had negatives (now sadly lost); but I was given his prints of them. Excellent site Paul, looking forward to more interesting photo’s mate….. I was thrilled to see the picture of Bullecourt as my grandfather fought there with the Aussies. We visited in 2010. Is there a copyright on the pictures on this website? I’d like to use the Bullecourt picture in juxtaposition with a present-day shot in a presentation on our tour of the battlefields. Hi Linda – there is copyright on the images on the site but if you want to use it for the purpose you state then please be my guest and glad it was of interest. Hi, Just finished some interesting research on the 2nd Queens and found a photograph album compiled by Queens officer Secretan between May 1916 and October 1917, some really fascinating photos taken around St Leger including this exact photo! The added bonus he names the officers in the shot with one exception which is your man Ron Short however Ron Short appears in many of the other photos taken by Secretan. The other names given at the bottom of the photo added by Secretan him self from left to right are: Gibson, “Short” , Innes, Mawditt, How. Our local Gainsborough newspaper paper in 1918 mentions “Lieut Colonel Mawditt, second in command of the West Surreys.” He was from a large family with several sons in the army. Will this be the same Mawditt named in the photo? It does appear that Lieut Colonel Mawditt’s parents lived in Gainsborough. I’m writing a local book about the town in WW1. Would it be possible to include this photo with a suitable acknowledgement?